As promised (aka warned), today I will be talking about my sock situation. 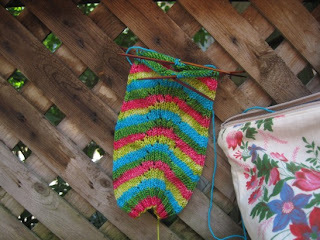 But I like to knit socks in summer because I can knit outside then - which means I am knitting on the move in a park or at a bus stop, and for that, only a sock will do. Or perhaps I mean the cuff of a top-down sock or the foot of a toe-up one, because once you've passed the heel in either direction you have a floppy swingy thing hanging down as you walk which I find impacts the drag on my subsequent stitches. I am out of 2.25mm double pointed needles. Now, I could just take that as a sign I should be finishing the four socks currently on my needles, and a sensible person would probably do that. But I can't help thinking the better plan is to buy more 2.25 double pointed needles and cast on a new set of cuffs with my Slughorn sock kit. I mean, it is back-to-school season. Am I right or am I right? When guys run out of underwear, they just buy more. So ... why not more doublepoints when you run out??? After all, they're both necessities - right?